Today is The Feast of Our Lady of Lourdes and The World Day of the sick. 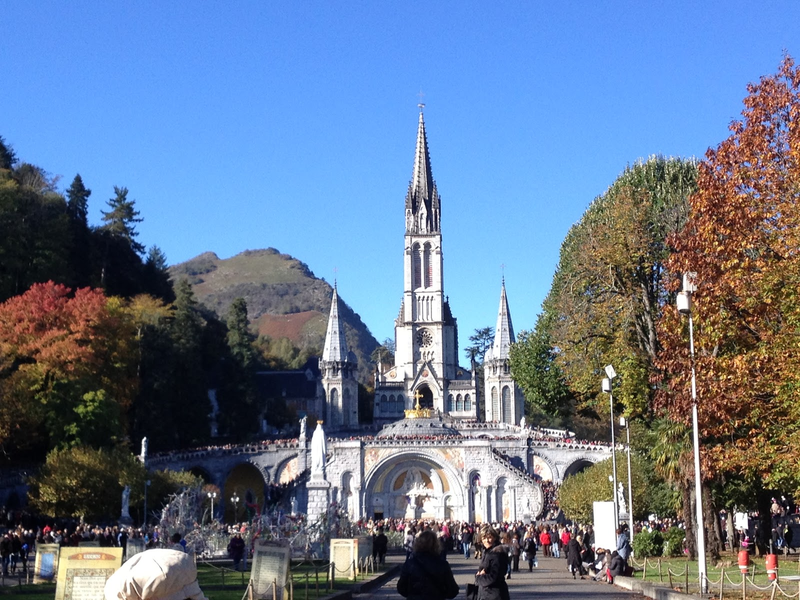 There is also a special connection between Lourdes and The Holy Face of Jesus. France is known for it’s special devotion to The Holy Face of Jesus. (Sr. Marie St. Pierre, The Holy Man of Tours, St. Therese of The Child Jesus and the Holy Face, to name a few examples.) 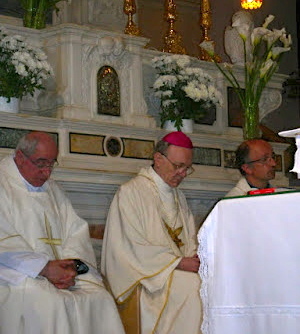 In April of 2010, the bishop of the diocese of Tarbes-Lourdes, Monsignor Philippe Perrier, had visited the Shrine of the Holy Face of Manoppello, accompanied by a delegation which included Francois Vayne, editor of the Lourdes Magazine and Doctor Alessandro De Franciscis, director of the organism which documents and investigates miracles which take place in the Lourdes. The French Bishop was welcomed by the Archbishop of Chieti-Vasto Bruno Forte and by the rector of the Shrine, Fr. Carmine Cucinelli. Bishop Perrier celebrated the Mass in French, remaining in prayer before the Holy Face. Deeply moved, the Bishop stated that he had “seen in the suffering Face of Manoppello the sufferings of the Madonna of Lourdes”, inviting those present to “be worthy of this extraordinary treasure of grace”. 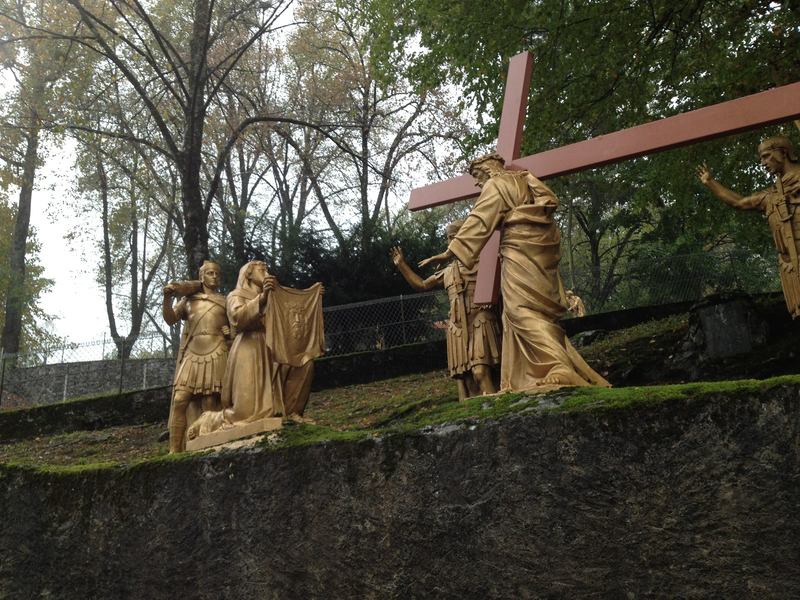 After his encounter with The Holy Face at The Shrine of Manoppello, Bishop Perrier proposed an extraordinary event; an exhibition titled “L’IMAGE DU CHRIST A TRAVERS LE VISAGE DE LA VIERGE” – “The image of Christ through the face of the Virgin” which was held in the exhibition hall of the famous Marian Shrine of Lourdes from September 1 – October 2 in 2011. A significant part of the exhibition focused on the relationship between the Holy Face and the Face of the Madonna in the various expressions of devotion and faith that are common to Lourdes and Manoppello, the faces of sick, suffering and pilgrims. As Pope Francis reminds us so often, “Every sick and fragile person can see in your face the Face of Jesus, and you can also recognize in the suffering person the body of Christ.” He continually demonstrates that element of devotion to The Holy Face of discipleship in seeking the Face of Christ in the poor, the sick and the weak and by being the Face of Christ to them. 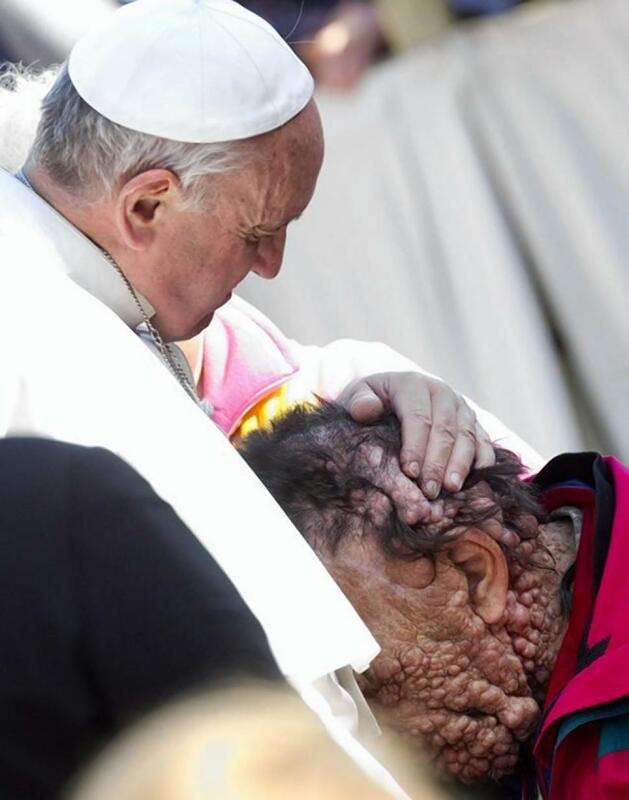 The world was stunned when Pope Francis embraced a severely disfigured man shown in the photo below. What compassion! Today is the 4th day of the Holy Face Novena, which can be found in the previous post. As we lift up the sick before the Holy Face of Jesus this day let us also place them in the most compassionate, Immaculate Heart of Our Lady of Lourdes who sees in them the Face of her Son. Remember, too, in our prayers doctors, nurses and all healthcare workers and caregivers, who make great sacrifices in order to show the loving Face of Christ to the sick. May God grant us all compassion for the sick and patience in suffering. May God bless them and shine His Face upon them! Be blessed, O most pure Virgin, for having vouchsafed to manifest your shining with life, sweetness and beauty, in the Grotto of Lourdes, saying to the child, St. Bernadette: “I am the Immaculate Conception.” A thousand times we congratulate you upon your Immaculate Conception. 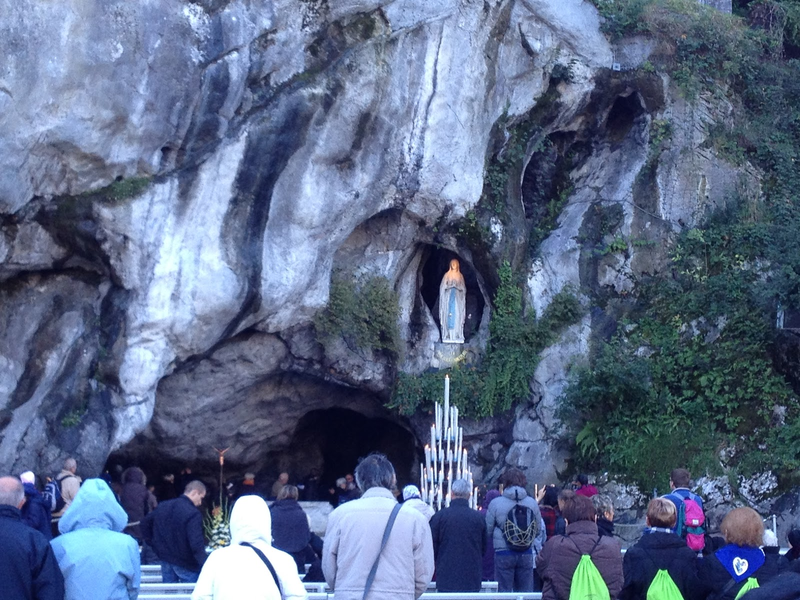 And now, O ever Immaculate Virgin, Mother of mercy, Health of the sick, Refuge of sinners, Comforter of the afflicted, you know our wants, our troubles, our sufferings deign to cast upon us a look of mercy.By appearing in the Grotto of Lourdes, you were pleased to make it a privileged sanctuary, whence you dispense your favors, and already many have obtained the cure of their infirmities, both spiritual and physical. We come, therefore, with the most unbounded confidence to implore your maternal intercession. Obtain for us, O loving Mother, the granting of our request. Our Lady of Lourdes, Mother of Christ, you had influence with your divine son while upon earth. You have the same influence now in Heaven. Pray for us; obtain for us from your Divine Son our special requests if it be the Divine Will. Amen.Our Lady of Lourdes, pray for us.Saint Bernadette, pray for us.